It wasn’t always pretty, but the Canes pulled it off. Could they have made it any more dramatic? It took the No. 13 Miami Hurricanes all but six seconds on the clock to score the touchdown that broke a seven-game losing streak to the Florida State Seminoles. They’ll take it – and so will UM fans. “This was for the guys that didn’t win,” Miami redshirt junior quarterback Malik Rosier said after the game. In years past, the Seminoles not only haunted the Hurricanes but also consistently threw a wrench into Miami’s overall success each season. Fans often call it “the post-FSU hangover” – whenever Miami loses to Florida State, its momentum as a team takes a downward spiral. Canes football refused to let that be the case in 2017. The simple, although unpopular, answer is we still don’t know for sure. There is still too much of the season left to play, and the U won’t be back until the Hurricanes make noise as a national championship contender again. Still, UM fans across the country can now be confident that the future of Miami football looks brighter than ever. The team is on the right path back to national glory, proven by defeating FSU. It was the first big hurdle the Canes needed to overcome. Rosier proved on Oct. 7 that not only did Richt make the right choice starting him at quarterback, but he may continue to lead the Hurricanes down the path of success for the next couple years. Sure, he completed less than 50 percent of his passes against the Seminoles. Yes, he missed targets left, right, high and low through the first three quarters of game. But when it counted most, with 1:24 left in the final quarter, Rosier marched his team down the field and completed a perfect pass to Darrell Langham to win the game. That’s what a top-tier team needs from its starting quarterback in the best conference in football – a guy with a short-term memory. The team needs a resilient quarterback who can forget prior mistakes and bounce back to perform at the most important times. Rosier has “it” – the big play potential to be the leader of the Hurricanes. You can’t teach that. It’s innate. Senior receiver Braxton Berrios also showed that the program is making its way back to the top. 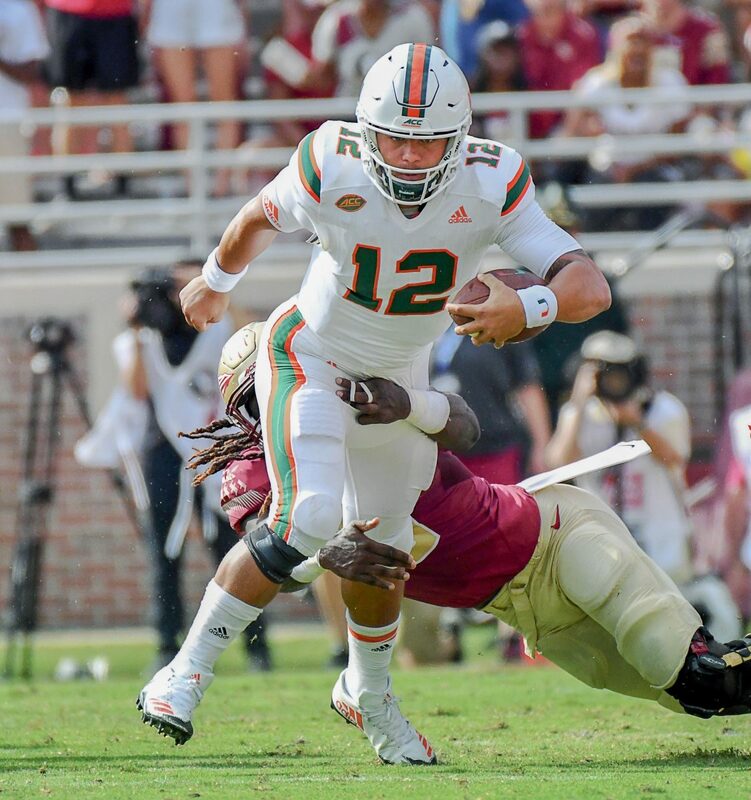 Berrios exhibited what it means to possess Miami football toughness. Every time it looked like the Canes had nothing left to give on offense, Berrios was there, making catch after catch. Not only did he score two touchdowns, secure two first downs on the final drive and return a punt 44 yards, but he made all that happen when his team needed him most. Rosier and Berrios are two players demonstrating that the Hurricanes are on a different level this year – they never quit. This will only continue in the years to come. After overcoming the road block that was Florida State, time will only tell what’s next for the team this season. “We definitely would love to end up in Charlotte to play for the [ACC] Championship, especially because Miami has never represented in that game,” Richt said.